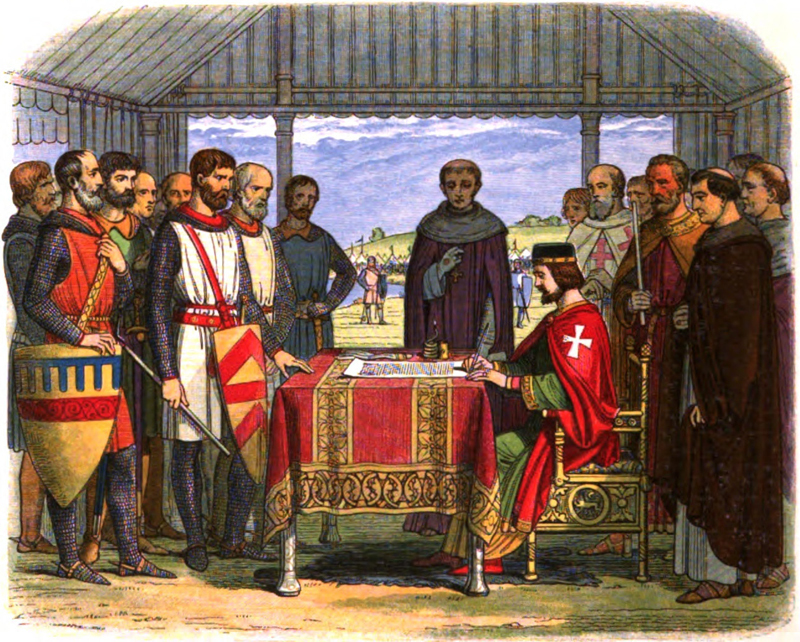 The Magna Carta was signed on June 15, 1215. There’s no better way to mark the 800th anniversary of the signing of Magna Carta than to raise a glass of ale to the key role it has played in supporting liberty and the rule of law. It not only laid down the right to trial by jury, habeas corpus and an end to the tyranny of monarchs but also decreed there should be “a standard measure for ale throughout the kingdom.” In other words, inn keepers could no longer rip off drinkers by giving them less than a full pint. Clause 35, which stipulated the need for a standard measure, may not have been uppermost in King John’s mind when he put his seal to the charter in 1215. But he and the powerful barons surrounding him would almost certainly have toasted the occasion with a flagon or two of good ale. The mighty River Thames flowed alongside the field at Runnymede where the ceremony took place. But its waters were full of bacteria and were undrinkable. Ale, brewed in every home from the poorest serf’s to the noblest lord’s, was safe to drink as the water was boiled to kill the bugs. It was a life-enhancing beverage, made from vitamin-rich grain at a time when the diet of the common people was scarcely better than that of the cattle and pigs they reared. To celebrate the charter, whose libertarian values were carried across the Atlantic and enshrined in the American constitution, several British brewers have produced special Magna Carta ales. Without the aid of a time machine, it’s impossible to say what a beer of the 13th century tasted like. But we do know from records at the time that sweet gale, bog myrtle, ground ivy—also called alehoof—yarrow and many other herbs, plants and spices were used for flavoring and to prevent ale going sour after just a few days. The Windsor & Eton Brewery, close to Runnymede and in sight of Windsor Castle, one of the present monarch’s many residences, was first out of the blocks with a 7.2% Magna Carta Ale. It’s bottle conditioned and comes in a handsome 750-mL bottle with a driven cork and cradle. The brewery staged a competition with London Amateurs Brewers, a group of mustard-keen home brewers. The winning recipe was designed by Manmohan Birdi, an osteopath from South London, and was brewed with pale, crystal and black malts, dark caramel sugar and hopped with Fuggles and East Kent Goldings. The beer’s medieval character came from the addition of ground ivy, licorice and yarrow, which are added during the kettle boil with hops. The dark copper-colored beer has a big hit of licorice on the aroma with scorched grain, herbs and spices. Bitter, peppery hops build in the mouth with licorice, dark grain and herbs. The bittersweet finish is rich in herbs and spices, hop resins and dark grain. It’s fitting that Shepherd Neame, Britain’s oldest brewery founded in 1698, should offer a Magna Carta ale, especially as its home town of Faversham, in the heart of the Kent hop fields, has one of the original copies of the charter. The 8% bottle-conditioned beer is brewed with pale and colored malts and hopped with Kentish varieties and is infused with fennel, mugwort, woodruff and yarrow. The copper-colored beer has an intense aroma of herbs and spices with the aniseed-like note of fennel leading the way. There’s a fine earthy and resinous note from the hops along with toasted grain. The palate has a fine balance of hop resins, herbs, spices and a barley-sugar note from the malt, followed by a long and complex finish, ending dry, with lingering notes of aniseed and spice. The Bateman family brewery was founded in 1874 at Salem Bridge in Lincolnshire. It’s close to the major town of Boston and the names of both town and bridge went with the Founding Fathers to the American colonies. Bateman’s is run today by the siblings Jaclyn and Stuart and they chose the county capital of Lincoln, with its cobbled medieval streets, half-timbered buildings, soaring cathedral and austere castle, to launch their Law of the Land, 5.5% ale. It’s brewed with pale, crystal and chocolate malts, and is hopped with Challenger and Jester varieties. Jester is a new English hop, developed to offer some of the citrus notes demanded by modern brewers and drinkers. While the beer uses none of the medieval ingredients of the other Magna Carta ales it does have a fine spicy and herbal note. The color is deep russet, there’s a spicy aroma with chocolate, toasted grain, vinous fruit and tart hops on the nose. Smooth malt, dark fruit, spice, chocolate and bitter hops combine in the mouth, followed by a dry and beautifully balanced finish with notes of spice, tart fruit, chocolate and bitter hops. If you’re able to visit Lincoln, the beer is on sale in the castle shop and there’s an excellent film that traces the history of the battle between barons and king that led to Magna Carta, a demand for freedom and justice that has reverberated throughout the world. Castle Rock Runnymede 800, a 4.2% golden ale brewed with honey and American and New Zealand hops. The brewery is based in Nottingham, famous for its castle and the exploits of Robin Hood. Greene King 800th Anniversary Ale, 5%, brewed with the addition of juniper berries in the kettle. The brewery is based in Bury St Edmunds in Suffolk, and the town is named after King Edmund who was slain by Danish invaders in 869AD. Milestone Brewing Magna Carta 5%, a golden hoppy ale. The brewery is based in a village in Nottinghamshire called Cromwell, named after Oliver Cromwell who put an end to the “divine right of kings” in 1649 when Charles I was executed and Cromwell led the brief republican Commonwealth of England. Roger Protz is the author of 300 Beers to Try Before You Die and 300 More Beers to Try Before You Die. Respected beer authority and editor of the CAMRA Good Beer Guide, he may be reached via protzonbeer.co.uk.